I have to say I wasn’t happy with Batista winning the Royal Rumble last night. Something about a guy leaving for four years then being back a week and already having a main event spot at Wrestlemania rubs me the wrong way. My dismay was nothing compared to the reaction on Instagram. The first three commenters seem to be on the same page. Between Daniel Bryan not even being in the Rumble and Batista eventually winning it, there were alot of pissed off fans. I can honestly say I’ve never watched a Rumble where the most popular guy (Bryan, by far) wasn’t included in the match. Not wanting someone to main event Mania is one thing, but not allowing the guy to even be in the rumble is just plain dumb. 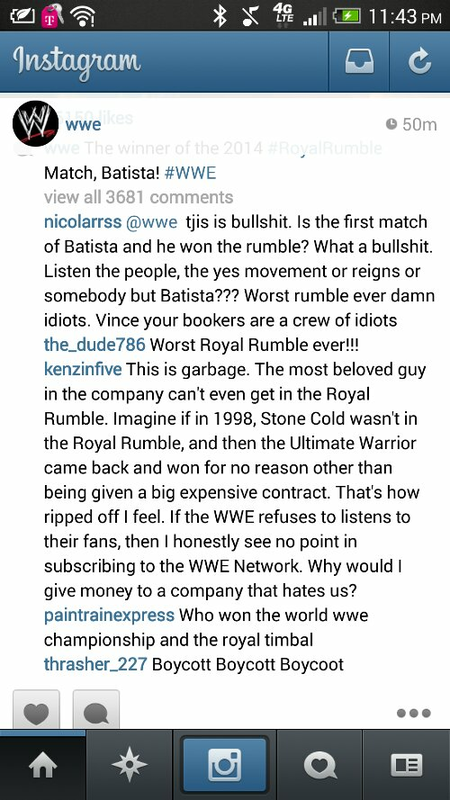 While most of the commenters were pissed off, @paintrainexpress just wanted some answers: someone tell him who won the goddamn royal timbal! And while we’re at it make sure that last commenter knows another word besides boycott. Posted on January 27, 2014, in Average Blog Posts and tagged batista, bryan, daniel, instagram, royal, rumble, WWE. Bookmark the permalink. 1 Comment. (not that I personally would want to…HaHa). You definitely put a fresh spin on a subject that’s been discussed for a long time.